In October, the National Academy of Medicine (NAM) elected 85 new members in recognition of the major contributions these individuals have made to the advancement of the medical sciences, healthcare, and public health. Among these new members is Hector Rodriguez, Henry J. Kaiser Endowed Chair in Organized Health Systems and Professor in the Division of Health Policy and Management. Rodriguez was elected to the National Academy of Medicine for his work “integrating organization science theories and methods to assess the impact of health care teams and primary care re-organization on patient engagement, patient experience of care, and outcomes particularly for vulnerable populations,” according to a NAM press release. Election to the Academy is considered one of the highest professional honors in the fields of health and medicine. 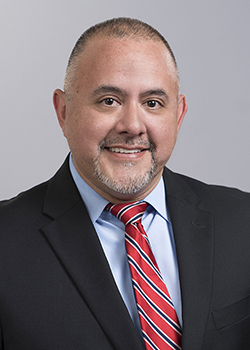 Rodriguez is chair of the School of Public Health’s PhD Program in Health Policy and co-director of the Center for Healthcare Organizational and Innovation Research. His research examines the impact of organizational interventions to improve primary care quality and health system effectiveness. Rodriguez has published extensively on the impact of healthcare delivery system interventions on patient care experience and outcomes. Prior to his academic career at UC Berkeley, he was a management consultant for The Permanente Medical Group where he worked with clinicians in northern California to redesign primary care and evaluate its impact on patient care.